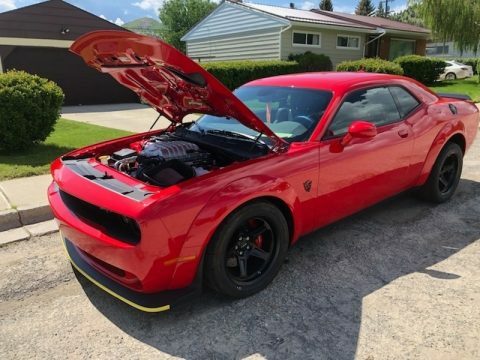 2018 Dodge Challenger SRT Demon for sale in Anaconda, MT 59711 This 2018 Dodge Challenger SRT Demon is powered by a 6.2L V8 Gas engine, paired with an 8-Speed Automatic Transmission. This beauty is shown in Red, has been garage kept. This Factory Drag car is from a limited production. Features: Demon Crate and Accessories included with Purchase Leather Interior Heated and Cooled Seats Navigation Bluetooth Keyless Entry AM/FM/CDCutout Exhaust Ground Effect and; Engine LED Lighting Seller's Note: We have all available photos and information included in the ad, but you are more than welcome to come inspect. Call the number below to do so. Please call (402)502-8385 for more information. ATTENTION BUYERS *Caveat Emptor* Please Remember to Inspect Vehicle Prior To Purchase!